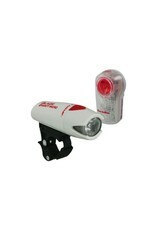 Stay safe with Planet Bikes Superflash Turbo & Blaze Micro light set. This set includes a powerful 139 lumen headlight and tail light with mounting hardware. Increase your visibility during all conditions including daylight and see further at low light levels.